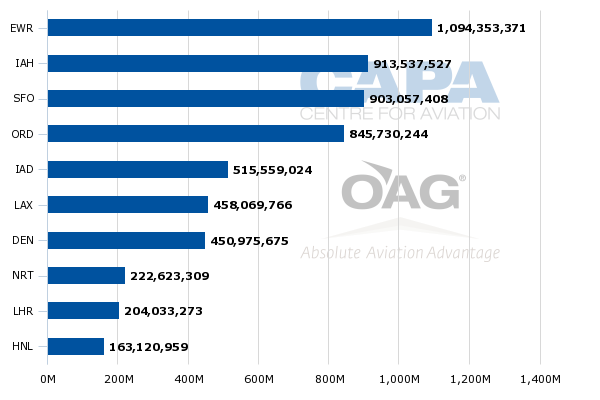 Solid 3Q2015 profits by the Big Three US airlines – American, Delta and United – were unsurprisingly overshadowed by continued unit revenue degradation, and also preliminary capacity projections for supply expansion in 2016. The capacity growth is occurring as none of the three major airlines are offering a specific time period of when their passenger unit revenue performance will improve. 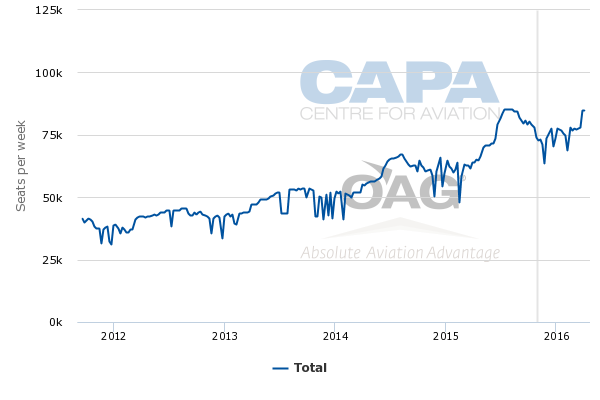 Those airlines, however, are indicating that they will lap some of the main drivers of the unit revenue pressure – USD appreciation against most global currencies and lower fuel surcharges in in 1H2016, which should shrink the wide year-on-year decreases posted in 2015. 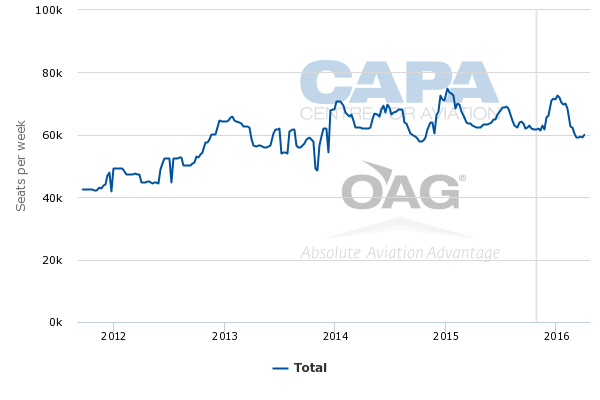 Pricing pressure in pockets of the US domestic market – Dallas and Chicago – continues to be a challenge, particularly for American Airlines, which has faced growing competition from low cost and ultra low cost competitors. Now American finds itself carefully explaining that strategy of matching fares as it navigates increasing competition from lower cost airlines. System passenger unit revenue decreases during 3Q2015 for the three large global network airlines were largely in line with previous projections, with American posting the largest declines, a trend that has occurred throughout 2015. United recorded the best domestic passenger unit revenue performance among its global US peers, with just a 1.7% reduction compared with a 7.6% drop for American and Delta’s 3% decrease. Even though its domestic unit revenue declined year-on-year during 3Q2015, United’s out performance is impressive given the pricing pressure it faces in Chicago and the fall off in corporate demand in the oil sector, which has affected its hub at Houston Intercontinental. Chicago O’Hare and Houston are United’s second and third largest hubs measured by seat deployment. 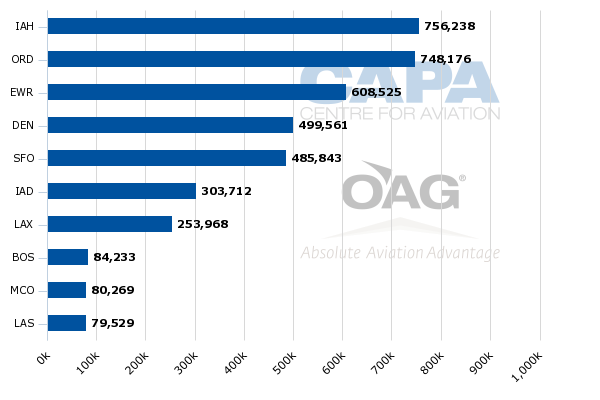 The airline is O’Hare’s largest airline measured by seat deployment with a 44% share. American holds a 36% seat share at its O’Hare hub. Houston Intercontinental is United’s second largest hub based on ASMs and O’Hare is its fourth largest by that measure. Although at the end of 2Q2015 United stated that it felt the deepest revenue declines in the corporate energy sector had occurred, its performance on a sequential basis in 3Q2015 was worse than 2Q2015. During 2Q2015 corporate revenues from United’s oil and gas clients fell 30%, and the decline grew to 35% in 3Q2015. United chief revenue officer Jim Compton attributed its outperformance in the domestic sector to improved operations and revenue managing to ensure a favourable passenger mix travelling on aircraft during high demand periods. During the last couple of yeas United has been working to improve its operational performance after a dismal summer in 2012 sent some corporate clients to other airlines. At the end of 3Q2015 United stated that its consolidated on time performance had improve five points year-on-year, and it had also cancelled 30,000 fewer flights during that time period. Delta attributed its 3% decline in domestic passenger unit revenue in 3Q2015 to the factors that have been pressuring its performance in that metric throughout most of 2015, namely pricing pressure particularly in Chicago, Dallas and Orlando. Although Delta stated demand remained strong, it concluded its yield performance in the US domestic market was not as robust as it has been in the past. American stated that it experienced its strongest domestic performance in 3Q2015 at its hubs in New York and Charlotte, and the weakest performance in hubs that have the greatest share of connecting traffic into its system. The company stressed it continues to see year-on-year pressure in the Dallas market driven by Southwest’s expansion from Dallas Love Field. Southwest has grown its Love Field base during the last year after the lifting of the Wright Amendment that prohibited certain long haul flights within the US from the airport. DFW is American’s largest hub by a wide margin measured by seat deployment. Dallas/Fort Worth also represents far more ASMs than American’s other top hubs. American and all the airlines operating from Dallas/Fort Worth have cited significant capacity growth and pressure on fares due to Southwest’s expansion. As American has experienced growing competitive overlap from Southwest and ULCCs Spirit and Frontier in 2015, it has continually stressed it would match the fares offered by those airlines. Although Delta and United are increasingly experiencing more pressure from ULCCs, American historically has had the highest competitive overlap with Spirit Airlines. At the end of 3Q2014, Spirit estimated it had 50% network overlap with American, driven by Spirit’s rapid build up in Dallas during the last two to three years. 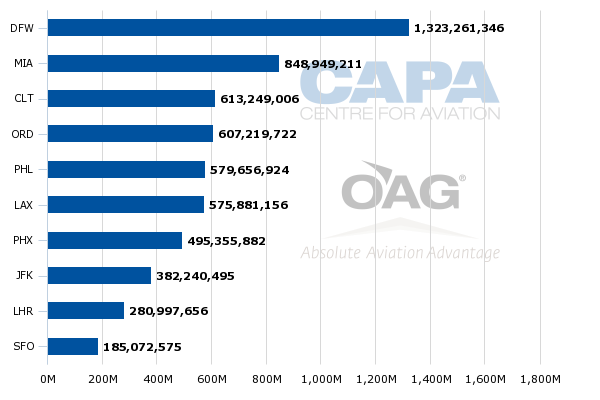 Recently American president Scott Kirby estimated that 28% of the airline’s domestic ASMs have non-stop competition from Spirit, which is larger than overlap with its rivals Delta or United. Even as American continues to face a greater amount of pressure on its domestic unit revenues than Delta or United, Mr Kirby stated that overall in markets where American has matched low cost competition, its unit revenue performance has performed on the same levels as the rest of its domestic system. “Every single market that we are matching any low cost carrier is profitable,” said Mr Kirby. American has achieved that by posting higher load factors on off-peak flying. Spirit Airlines, which has suffered the worst unit revenue degradation in the US industry, has cited pricing pressure, particularly on marginal flying. Spirit’s observations appear to reflect some of the tactics American is using to combat the increasing pressure it faces from low cost airlines. Worsening conditions in Brazil have also dragged down American’s passenger unit revenues in Latin America, which dropped 10.4% year-on-year during 3Q2015. The airline’s passenger unit revenues in Brazil fell 25% year-on-year, and Mr Kirby stated that American does not expect any improvement in Latin America until Brazil’s economy turns around. Brazil’s GDP is forecasted to contract 1.5% versus previous estimates of 1.4% growth. Mr Kirby stated that American has cut capacity by 30% in the Brazilian market, but “total capacity in the market is up quite a bit”. 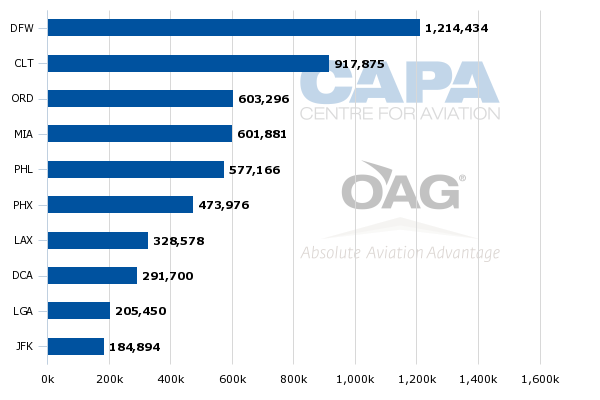 Both Azul and Delta Air Lines are expanding between the US and Brazil, and data from CAPA and OAG show that for the week of 26-Oct-2015 American remains the largest airline between the US and Brazil with a 36% seat share, followed by its oneworld partner TAM with a 28% share. United holds a 14% share and Delta has a 5% share. Azul, which has introduced flights from Campinas Viracopos to Fort Lauderdale and Orlando, has a 5% share. Total one way seats between the US and Brazil are up 4.5% year-on-year to roughly 61,688. American’s capacity to Latin America during 3Q2015 was down 3% in 3Q2015 and fell 5.7% for the 9M ending Sep-2015. Delta, which has been growing rapidly in Latin America despite the region’s economic weakness, slowed its expansion of supply to 1.6% in 3Q2015. That follows a year-on-year jump of 13% in 1Q2015, and a nearly 8% rise in 2Q2015. Delta’s passenger unit revenues on routes in the region fell 5.3% year-on-year during 3Q2015, mostly driven by Brazil’s declining currency valuation. As of mid-Oct-2015, the exchange rate was USD3.80 to the BRL. American, Delta and United all posted steep passenger unit revenue declines on Pacific routes in 3Q2015 of 11.3%, 9.3% and 11.6%, respectively. American’s capacity to the region jumped nearly 10% year-on-year due to the airline’s efforts to shore up its presence in Asia after historically lagging behind its peers. During the last couple of years American has added flights from its DFW hub to Beijing, Hong Kong, Shanghai, Tokyo Narita and Seoul. American recorded flat year-on-year passenger unit revenue growth in South Korea and Hong Kong, said Mr Kirby. He cited weakness on routes to Japan and China. United Airlines has the largest presence between the US and China, with a 24% share of the roughly 73,735 one way seats on offer between the two countries for the week of 26-Oct-2015. Mr Compton stated that United was monitoring the changes in the country’s economy, and remarked that in Aug-2015 the company posted a brief drop in bookings after the country’s currency devaluation. But by Oct-2015 bookings had rebounded to pre-devaluation levels. The airline anticipates competitive capacity growth of 35% between the US and China during 4Q2015, but despite that pressure, United stresses the importance of China in its network. Mr Compton stated its service from San Francisco to the secondary market to Chengdu saw “meaningful” year-on-year improvement. Delta has been restructuring its Pacific operations for roughly a year, decreasing connections through Tokyo and downgauging aircraft operated in the region. Although Delta concluded that margins at its Tokyo Narita hub increased by 7ppt year-on-year in 3Q2015, lower fuel surcharges and currency pressure dragged down its Pacific unit revenues by 14ppt. All three of the US global network airlines also posted passenger unit revenue declines during 3Q2015 in the trans-Atlantic market. Delta recorded the largest decline of 9.5%, followed by a 6.9% drop for United and a 5.6% decrease at American. American had the smallest capacity increase for the quarter at 2.8%, followed by Delta’s rise of 4% and 4% growth for United. The main driver of passenger unit revenue decline in the trans-Atlantic was the appreciation of the USD, which for Delta represented 6.5ppt of its decline year-on-year during 3Q2015. American stated its decline was also largely driven by the appreciation of the USD. American, Delta and United are all forecasting unit revenue declines for 4Q2015 as the main factors contributing to the negative performance – currency headwinds, lower fuel surcharges and domestic pricing pressure – remain in place. American is forecasting a 5% to 7% decline, Delta a drop of 2.5% to 4.5% and United a decrease of 4% to 6%. Delta estimates 2.5ppt of its 4Q2015 passenger unit revenue decline is driven by foreign exchange pressure, and United believes f/x is driving 1.5ppt of its decrease. It also stated competitive pricing pressure will drive another 1.5ppt of the drop in 4Q2015 passenger unit revenues. American estimates that f/x pressure and lower fuel surcharges combined are driving 2.1ppt of its forecasted 4Q2015 passenger unit revenue decline, “which is down from 2.7 points in Q3 as we're beginning to overlap the time when the dollar started strengthening last year,” said Mr Kirby. The three global US airlines are not venturing to guess when passenger unit revenue declines will level off, American, Delta and United. But they are still planning to grow capacity in 2016. American is expecting 2% to 3% system growth, Delta 2% system growth and United expects an increase of 1.5% to 2.5%. Delta is not breaking out its domestic versus international supply targets. United anticipates 1% to 2% growth in domestic markets and a 2% to 3% rise in international regions. Mr Compton stressed that United always keeps an eye on demand, but is “comfortable with the breakout right now”. American estimates that 1ppt increase of its 2016 capacity increase is driven by growth in Pacific markets and another 1ppt is due the extra day in Feb-2016 due to leap year and aircraft densification projects. Both Delta and United conclude their projected capacity growth for 2016 is in line with projected US GDP growth of roughly 2.8%, and obviously believe that aligning their expansion with US economic growth is a sound strategy. Each of the large US airlines seems willing to re-examine its capacity targets if demand or economic conditions worsen; this may need to occur as uncertainty over the global macroeconomic economy grows. United during 2015 has refined its capacity growth downward three times. Its original projections of domestic capacity growth were 0.5% to 1.5%, but now its estimates are 0.25% to 0.75%. Its system projections have fallen from 1.5% to 2.5% to 1% to 1.5%. Many interesting dynamics are occurring in the US market place. Lower fuel costs are helping to drive top line profitability and strong margin growth, but passenger unit revenues are being dragged down by foreign exchange pressure and pockets of weak pricing in some of the largest domestic markets in the US. The theory that ULCCs are flying under the radar of the US majors is also being challenged as American, Delta and United are responding quickly to the competitive encroachment. In a low fuel cost environment this becomes easier, but there can be little doubt that the ULCCs are adding competitive pressure - and causing some pain as yields sink to match them. It is a complex set of circumstances for investors to navigate. But the overall message airlines are attempting to send is that record profits are on the horizon for 2015 even if pricing traction within some key areas of the domestic space remains weak.